As promised on our Facebook page, there will be new surprises around the first of every month until our big December launch! We thought a little Pinterest contest would add a little fun and help us get our name out before the big launch. Hampton Roads is such a beautifully diverse region with so many various wedding styles: classic, beach, nautical, military, rustic, vintage, urban, quirky, and more. So, readers, if your budget was limitless, your time infinity, and your talent boundless, what would YOUR dream wedding style be and look like in Hampton Roads? We will choose one winning Pin Board and its creator (you!) 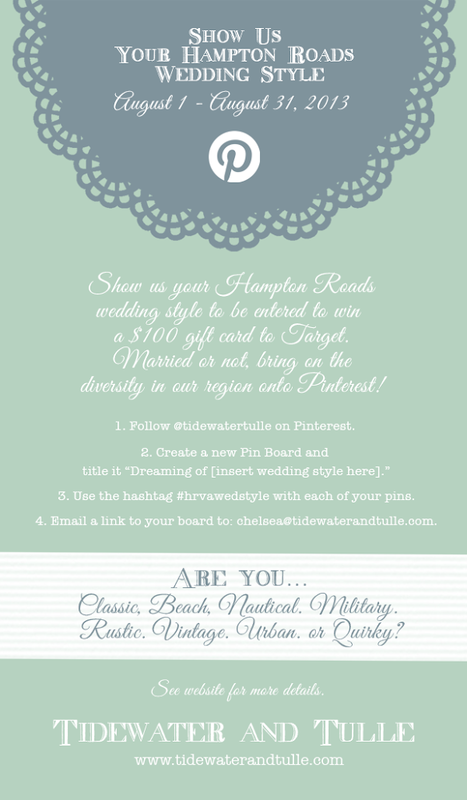 that wows us with their unique, complete wedding vision for a $100 gift card to Target. (Who doesn't like them some Tar-shay?) Be sure to really flesh out your themes with wedding details, moments, colors, wardrobes, food yumminess, beauty inspiration-- we want to see your full and complete vision! Not sure where to start? Check out Tidewater and Tulle's pins for some inspiration (and feel free to repin away!)! 1. You must email your "complete" (we know Pinterest is never complete!) Pin Board by 11:59pm EST on August 31, 2013. 2. Winner will be announced Monday, September 2, 2013 via Facebook and connected with that week to get mailing address information to ship out the $100 gift card. 3. The winner and runners-up's boards will be screenshot and posted on the blog. The legal stuff: This contest is in no way affiliated with Pinterest or Target. You can access and download the full contest rules here.